A winning intranet is like a snow leopard; very rare, mysterious, and beautiful. Winning intranets are years in the making; building and enhancing slowly over time, supported by active executive champions and funding. Emphasis on executive support — money follows the chiefs, and it flows down from the executive suite. And without funding, and the executive sponsorship to ensure it, your intranet will die a slow death. The intranet flounders, if not fails, when there is no clear ownership, or governance. Show me a successful intranet, and I guarantee it has a great, active executive sponsor, supported by clear intranet governance. The best intranets have superb executive sponsorship – usually the President or CEO or someone in the C-Suite. Think about it: your business is not a democracy, and power and money is consolidated in the c-suite. To succeed, the intranet needs funding, and it needs powerful supporters. Every intranet needs an executive champion — or two. All of the successful intranets at the last Digital Workplace & Intranet Global Forum in New York had one thing in common — executive sponsorship as part of a strong governance model. As is the case with most intranets it is simply impossible to achieve any long-lasting success without a clearly defined ownership and management structure. Intranet governance provides clarity and rules namely the titles, roles and responsibilities of its owners, managers, stakeholders and contributors. Like the content, planning and governance is technology agnostic; whether it’s SharePoint, IBM or another portal or content management system, the necessity for and the approach to governance is the same. Given its technology neutral status, governance is largely applicable to any technology platform. Intranet governance details the ownership model, and the roles and responsibilities for anyone who contributes to the intranet, particularly content contributors. More often than not, the business owner of the intranet is communications (sometimes called internal communications, employee communications, or corporate communications). Often the technology owner is IT (information technology, information systems or sometime called the e-business group). As such, Communications and IT must get along, and forge a symbiotic business partnership in order for the intranet to succeed. Sometimes HR plays a key role to, but not as often or as significant as those in IT and communications. It’s cliche, but it’s true: content is king. On the intranet, however, the content has to be timely, relevant, and meaningful. Employees demand it. Employees don’t go to the intranet to ‘surf’ or ‘hang out’. Employees go to the intranet for very specific content, often a phone number, a form, a policy or perhaps HR-related information. and then they’re gone until they need something again. Intranet content shouldn’t just be repurposed from print or the website; content on the intranet should be for employees, written for the screen, in an employee context (e.g. what’s in it for me?). Intranet content has half the words as print, is presented in the inverse pyramid format, and is presented in small chunks with lots of sub-headers, bullets and callouts. All content must follow content management principles and rules, follow publishing process and structure, and be consistently formatted and presented. Perhaps even more importantly, all content must have an expiry date that forces the author or publisher to revisit, renew or archive content. If the content isn’t kept up-to-date, then the content is automatically deleted. Without a content management plan, I can guarantee a less than optimal or failing intranet. A content management plan provides details and guidelines for content requirements, roles and responsibilities, formatting and writing, organizational processes and rules. An effective content management plan is an essential component in supporting strong information architecture and effective, timely, and relevant content for employees. It helps ensure that content is easily found by site users, and is easily updated according to the organization’s standards. This also means the search engine; when the content is good, and relevant, the search engine results are what employees hope them to be. We’ll examine the last three traits in Part II next week. In the meantime, have a look at the Master Ingredients of a Great Intranet webinar presentation which provides more insight into the necessary traits and ingredients for a winning intranet. 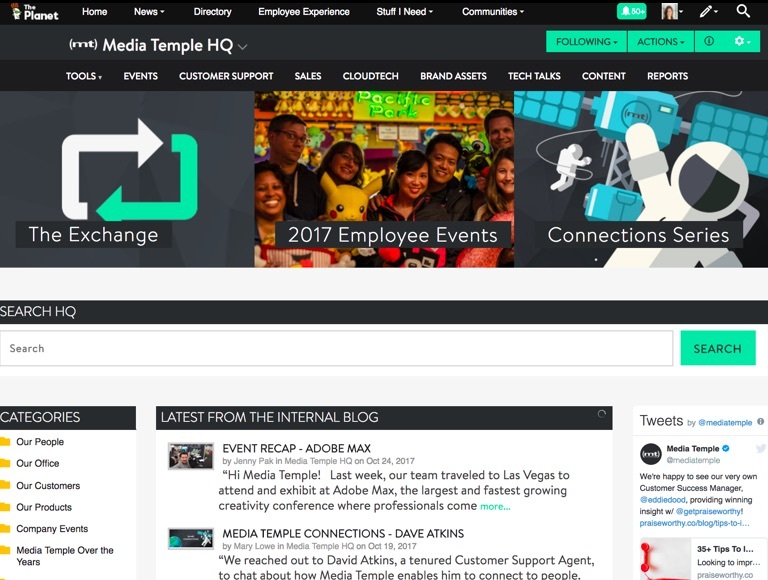 Want a close look at a winning intranet? See the Coca-Cola, Microsoft, Genuine Parts Company intranets at the 2018 Digital Workplace & Intranet Global Forum conference in Atlanta, May 9-10. Early-bird registration discounts are now open. Yep, after all the years of working on Intranets, its still the same key pieces that make a successful intranet. I think what happens in some cases is companies will cut a corner in one of these and then get less than perfect results. But if they keep at it and continue to invest time and $$ they will start to see the true benefits of a effective intranet. Well said! Thanks for the response, Tim. How is Vialect and your Noodle Intranet Software? Everything is going well. Thanks for asking. Glad to see you are still waving the “effective intranet” flag. Tony – Thank you for this! I just found your blog today and can already tell I’m going to get so much out of it! My role at my company is Engagement Director and I’m responsible for helping support our clients in the running of their Intranet platform (our proprietary system for the Mortgage Industry). I am not much bothered about the content as it can be managed by users or the companies buying your intranet. The intranet should be highly customizable and optimized for smooth performance, even for the mobiles. These two points just take your intranet ahead of your competitors. You should include these two points in the article, let me know if they make sense to you.